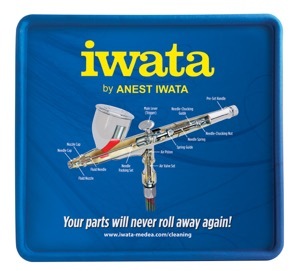 Have you ever had your nozzle or needle roll off your worktable? How many parts have you lost when you take apart your airbrush? With it’s unique raised edge, your parts will never roll away again! Take apart and reassemble your airbrush on a large, safe and soft surface with non-skid backing. 11.75" × 10.75".